We are a little over two months out from moving full-time into our Airstream, and I have so much on my mind about this. Last night I sat on my balcony looking out at downtown Houston super confused about my life, wondering what am I doing here, where am I going and what the hell happened? I didn’t question my choices. I am pretty confident about them but rather my inability to make more traditional choices at this age and stage in my life. In my adult life I have moved seven times. None of which can be considered small moves. We are talking 1000 plus miles at a clip to entirely new places with completely different landscapes and cultures. I hear the phrase “grow where you are planted” a lot, and you know…it irritates me. Try taking a palm tree, ripping it up and planting it in Antarctica and let me know how that works out. Growing where you are planted is a lot easier said than done when you don’t always get to decide where you are going. A lifestyle like this takes confidence when you feel the most insecure and courage when you feel the most vulnerable. It is hard. Not saying it should ever be taken for granted. The success, gains, and fulfillment in our lives are more than what we ever thought possible, but they do come with a price which has been hard on my relationships and mental well-being at times. I know the upsides really I do, but the downsides have been what I am thinking about these days because it is a part of my reality. I’ve had to leave friends, family, homes, and communities and no matter how many times I’ve done it, it never gets easier. Right now we live in the most incredible area of Houston (River Oaks/Upper Kirby) with access to the best shopping and restaurants in a beautiful apartment overlooking this stunning city. My life is pretty close to perfect but I’ve been increasingly anxious and discontent mainly because I’d like to put roots down here. I’m just not ready, and I don’t know when I will be. Honestly, I can’t face ripping up those roots up again. This is why I can’t decide. This is why I can’t settle down and commit like a normal person. When I do think about settling down here I think about green spaces and quieter streets tucked away in neighborhoods like maybe The Heights or the Museum District. Sometimes I even think about owning a ranch outside the city. 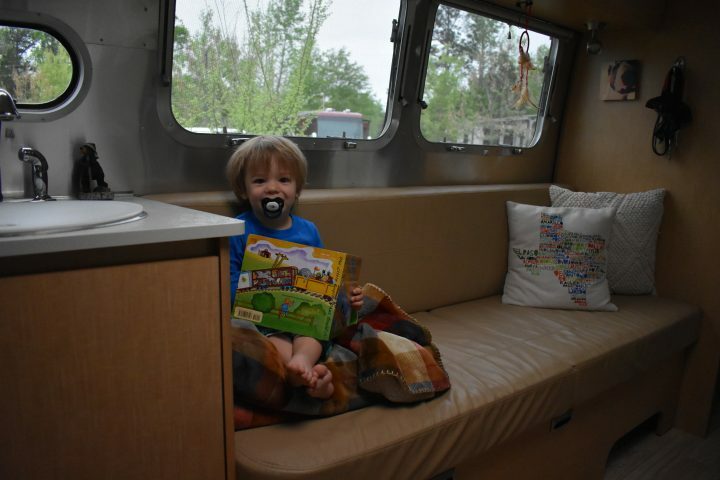 Texas will do that to you, I guess… I’m all over the place so right now I think about the Airstream, the most unconventional choice but the most logical for us because I need time and mobility to figure it out. This past week I’ve been really hard on myself about this inability to figure it out and settle down because I have a family. Settling down is what you are supposed to do, but the crazy part is Hank has benefited the most from all of our travel and a more flexible lifestyle. As a family on-the-go he has gotten so much more of our attention, so many more experiences and more opportunities to see family and friends. He is so confident and well-adjusted that it’s practically a miracle. I’m the one who needs to embrace more flexibility and eliminate the pressure to settle down right now. I need to be OK with settling down when I am ready and on my terms. Get outside your comfort zone. That’s the advice, right? Well, that’s cool because I’m always outside my comfort zone. The Airstream is my only comfort zone right now. It gives me what a traditional house can’t, and that is the ability to move when I want to and wheels to take me closer to where I want to be and to the people I want to see. It gives me the chance to see new places, but it also keeps me connected to the old and when you’ve racked up as many as I have it’s those wheels that bring you closer to home. We tend to be hardest on ourselves, and it’s hard to let old dreams go, but it sounds like y’all are doing right by yourselves and each other. Life on the road can be hard, but I guarantee that, looking back, y’all will feel much better having spent the time together as a family than you would were you apart.